Our 3D large scale printing technology is developed by our partner XtreeE in France. With our highly versatile Concrete 3D printer, Concreative offers various shapes and patterns allowing architects to sky’s the limits. With the world's largest 6-Axis arm 3D Printer, our team can 3D-print elements up to 4.5m height and up to 6m length in one shot. 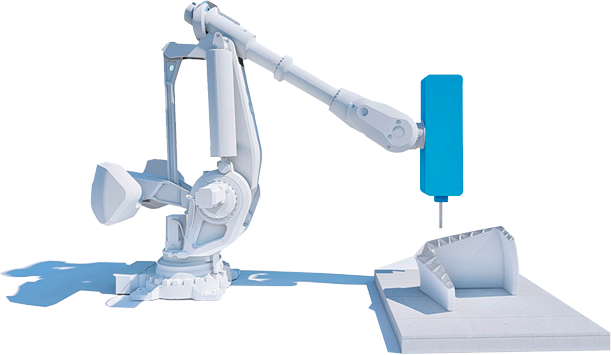 Our cement has been specifically developed for 3D printing applications. Its formulation with very low W/C ratio provides high compacity, low permeability and consequently impressive performance. As we produce unique architectural structures, we have selected the finest raw material to achieve compressive strength of more than 80 MPa. Within few seconds our cement paste is stable and provides high versatility in the design shape, this is due to using specific mixture and precise dosing that allows our 3D printed cement rehology to be stable. Using our special High Performance Concrete with low W/C ratio, the time-dependant effects on our formulation are null: no drying shrinkage and well-controlled plastic shrinkage due to high-quality controlled fabrication condition and cure control. Our selected material offers the finest, viable, long-term solution for sustainable construction owing to its high strength properties and low porosity. This shows an excellent resistance to aggressive environments. Our printing cement paste is inherently durable. The key factor of durability is permeability of the concrete where our selected material offers the highest compacity governed by the fine granulometry, increased flowability of our mixture and high accuracy of our 6-axis 3D printer. 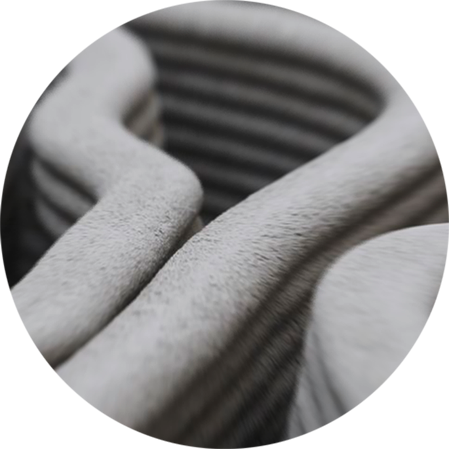 Concreative 3D printed concrete structures do not need finishing, surfacing or patching. Concreative offers various patterns and pigmentation to enhance the aesthetic of the product.